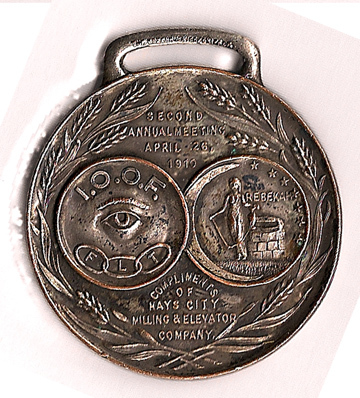 An Odd Fellows medal or fob, with two overlapping circles and wreathed in wheat. One circle shows the Eye, along with the acronym I.O.O.F and the three-links symbol with FLT. The other circle shows a woman standing next to a well, holding a jug attached to a chain or rope; a thin crescent along left edge of the circle, seven stars along the right. Outside of circles are two patches of text. Apparently from Hays City, KS. (Or just sponsored by a company in Hays City.) At time of catalog, ioofks.org shows no IOOF Lodge in Hays City, KS, but there are 37 active lodges in KS listed. Standard format reversible fraternal ribbon. Top pin is a florid plaque, with a beaver over IOOF enwreathed, and “Independent Order of Odd Fellows” written in flowing block letters. Recto, a secondary front ribbon of white silk or satin has embossed/leafed image of two crossed spear-tipped flagpoles, with a beaver in the space below and a maple leaf above, and with two applied ribbed red banners flying with the Union Jack in the canton. 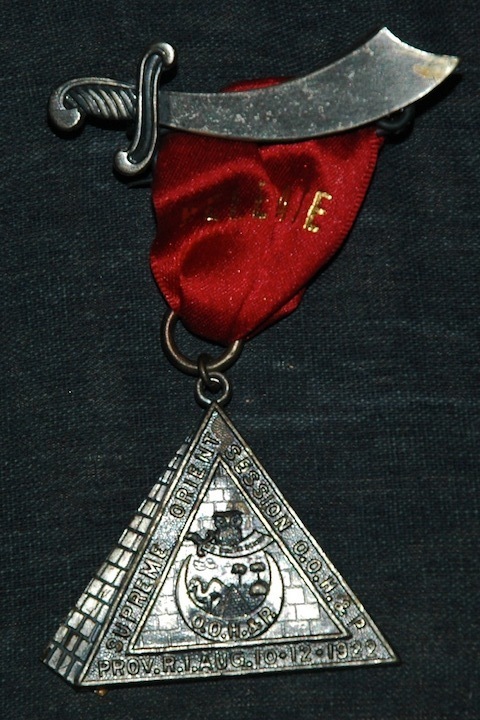 This secondary ribbon supports a circular, convex (possibly bakelite) medallion with the Eye and Three Links, also with “Independent Order of Odd Fellows” across top edge. 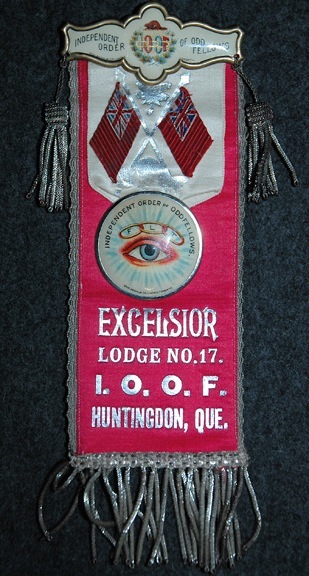 Recto primary ribbon is red silk or satin, with “Excelsior Lodge No.17. I.O.O.F. Huntingdon, Que.” embossed and leafed in silver. Verso ribbon is standard black “In Memoriam” with silver text and medallions. Overall, ribbon is bordered with silver bullion lace, with two dangling tassels from top and with heavy bullion fringe along bottom. Independent Order of Odd Fellows (IOOF) Centenial Anniversary medal. 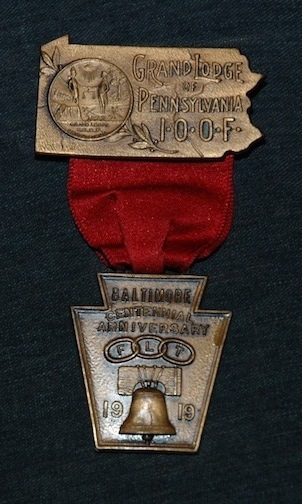 Upper pin portion is die cut in the shape of Pennsylvania, with relief decoration showing a seal with an all seeing eye, two men (one Native American, one Colonial) clasping hands with a scale suspended from their hands, felled trees, standing trees, and two groups of tools and weapons, one an ax and sword, the other a bow and three arrows. The year 1823 is shown twice, once on a tree stump and again below the men’s feet. From the upper panel hangs a brilliant red ribbon, from which is fobbed a medallion is in a keystone shape, with the three rings (FLT) and the Liberty Bell. Above reads “BALTIMORE CENTENNIAL ANNIVERSARY” and around the bell reads “1919”. This would have been sold at or before the convention to attendees. Verso shows makers mark, and there is an adhesive sticker from W&H on verso of ribbon. 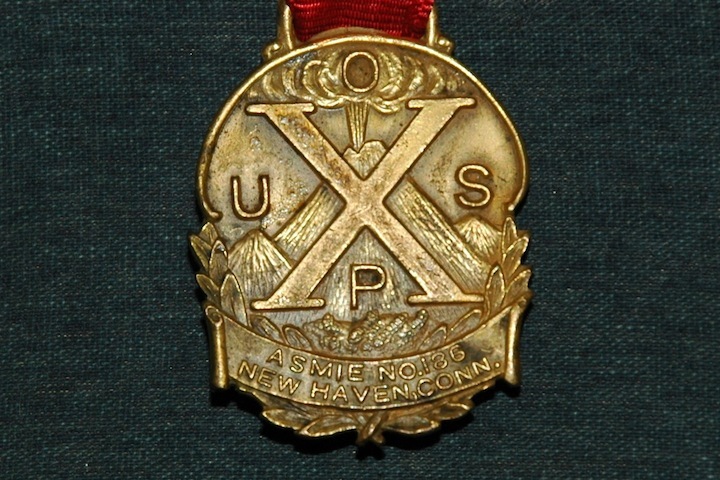 Oriental Order of Humility and Perfection (OOH&P) medal from the Supreme Orient Session held in Providence, RI, August 10-12, 1922. Probably pot metal or possibly brass with enamel. Upper, pin-back portion shows a colonial structure with a high smoke stack; another structure with a fence around it; the shield of the State of RI with banners above and below, reading “State of Rhode Island” and “Hope,” respectively; and a scene wherein a Native American in headdress grasps the hand of a man in colonial dress as he arrives in a boat. 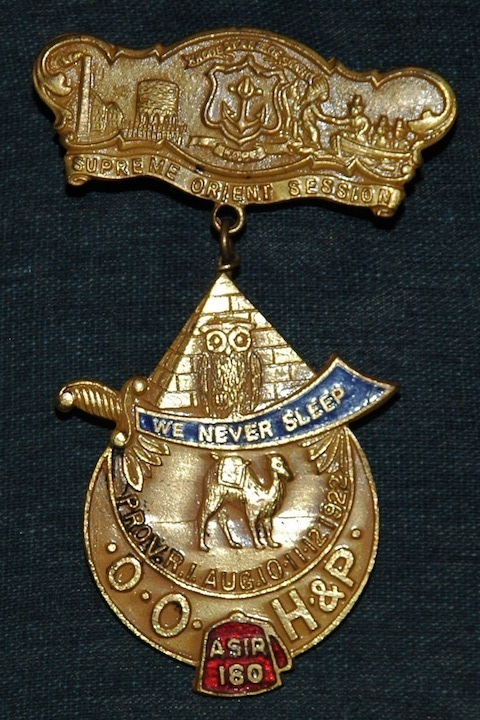 Lower portion exhibits the basic emblems of the Order; a pyramid; owl perched on a blue enameled scimitar with the legend “WE NEVER SLEEP;” a camel with “PROV.R.I.AUG10-11-12 1922” below it; an upturned crescent with “O.O.H.&P.”; a red enameled fez with “ASIR 180” in raised letters. Only two years after the badge was issued, the OOH&P would be absorbed into the United Order of Splendor and Perfection. Oriental Order of Humility and Perfection (OOH&P) medal, probably worn by those of the “Perfection” degree. Consists of three part. Upper pin-back portion reads “PERFECTION.” Suspended from upper plaque is a red and yellow ribbon gathered with a jump ring. Lower portion is the OOH&P pyramid, with “OOH&P down the foreshortened plane, and a mass of Arabic or Farsi text and the name “XERXES” on the facing plane. 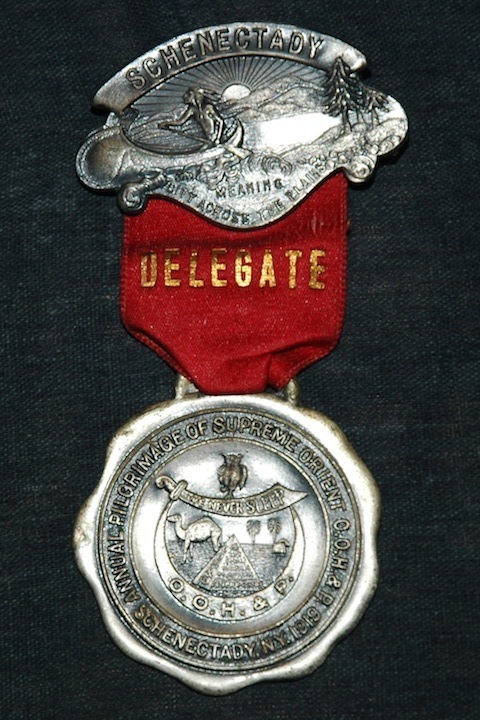 Suspended from upper plaque is a red ribbon with “DELEGATE” stamped in gold, from which is suspended the lower medal, which is a wavy-edged disk. In center is the basic emblem of the OOH&P consisting of an owl sitting atop a scimitar with the legend “WE NEVER SLEEP”. From guard to point of the scimitar extends below an upward-facing crescent moon with “OOH&P” on it. Between the scimitar and moon is a sort of scene or emblem consisting of a camel, facing dexter, the OOH&P pyramid as described above with palm trees in the distance, and a fez. Consists of three parts. Upper pin-back is a scimitar, with blank blade, pointed sinister. 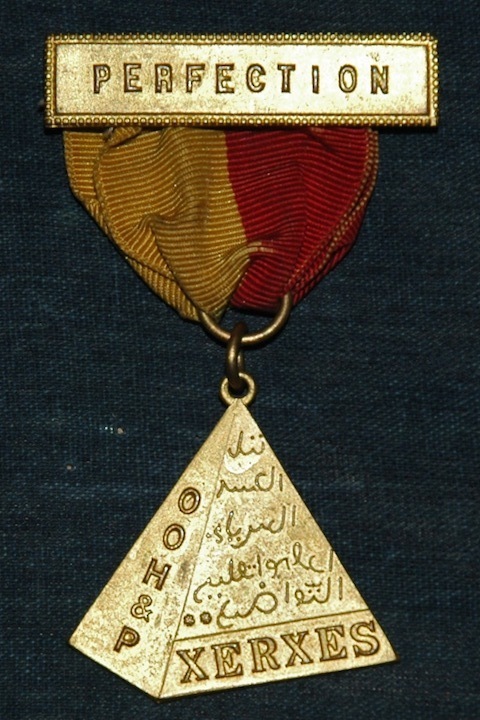 Suspended from the pin-back is a red ribbon with “DELEGATE” stamped in gold leaf, gathered to a jump ring from which hangs the main medal in the form of a pyramid. Foreshortened plane and background of facing plane is pressed to show ashlar. Around the sides of the facing plane is a legend, with text as recorded above. In center is the basic emblem of the OOH&P consisting of an owl sitting atop a scimitar with the legend “WE NEVER SLEEP”. From guard to point of the scimitar extends below an upward-facing crescent moon with “OOH&P” on it. Between the scimitar and moon is a sort of scene or emblem consisting of a camel, facing dexter, the OOH&P pyramid as described above with palm trees in the distance, and a fez. A generally circular plan medal showing a landscape consisting of a multi peaked volcano. The central and highest peak is erupting, with an upright jet that billows at the top. Over this scene is a large X, possibly for “Xerxes,” which is central to the precursor OOH&P ritual/regalia. At the four cardinal points are U O S and P, reading clockwise from the left. Below, a banner is stretched, with the legend “Asmie No.186 New Haven, Conn.” Behind the banner and extending up the lower sides is a wreath, possibly olive branches and/or a victory wreath. 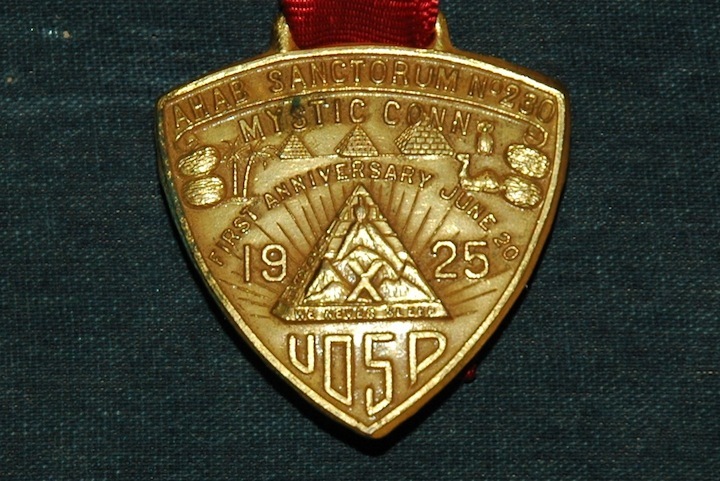 Asmie No.186 is the UOSP Sanctorum that issued the medal. In 1924, the UOSP was created to absorb the unofficial IOOF appendants (OOH&P, Knights of Splendor, Muscovites, and Cabiri) into a single body, apparently to bring them more under the eye of the National Grand Lodge.